In London in 1975, my maternal grandmother, Dorothy Connor, had her best ever crop of cabbages, despite record-breaking drought. From then on, she always grew Landcress (Barbarea vulgaris) amongst her brassicas. Thirty nine years later, Nan’s recommendation has been backed by scientific research at the University of Queensland. Question: “Hi Jerry, I am a novice gardener and live at Richmond (Tasmania). I wouldn’t miss Gardening Australia if I can help it. I am trying to establish an organic vegetable garden and am having trouble with cabbage moth. I have been unable to get Barbarea vulgaris seeds in Tas. Could you please advise me if Bacillus thuringensis, a bacterial spray, is safe or could you recommend something that is. Thank you in anticipation of your reply”. Dipel, which contains the bacteria Bacillus thuringensis (Bt), is an allowed input in organic gardens. It is non-selective, non-systemic pest control and must be reapplied after rain or irrigation. It is quite an expensive product. In my experience, this dormant bacterium may die during storage if the ambient temperature exceeds 21C for extended periods. When I managed the Royal Botanic Gardens Sydney (1992 – 2003) we kept our Bt at 4C by storing it inside a fridge in the nursery. Cool storage keeps Bt viable for extended periods. Glad you liked the segment, ‘Friends and Foes’, with Gurion, my friend and Entomologist from UQ visiting my food garden showing how growing the right cabbage crops and biocontrols can manage two common caterpillar pests, and reduce pesticide use, from these important economic crops. In that segment we showed Land Cress (Barbarea vulgaris) growing and flowering at Bellis, my home. I’ve been told Eden Seeds sells seed of B. vulgaris, calling it American Upland Cress, and Green Patch nursery in Taree offers seedlings in season. (B. vulgaris is also known as Bittercress, Herb Barbara, Rocketcress, Yellow Rocketcress, Winter Rocket, and Wound Rocket). Southern Harvest sells Barbarea verna, also called Land Cress, it is another species but with similar properties and uses. I was particularly delighted to receive confirmation by Gurion that Land Cress is a biocontrol. During unprecedented droughts and hosepipe bans in SE England during 1975 and 1976, many gardeners were unable to grow thirsty crops. My maternal grandmother, Dorothy Connor (pictured) was unable to grow watercress (Nasturtium officinalis), so instead she grew Land Cress (Barbarea vulgaris). This has a slightly hotter flavour and similar uses, but requires less water to succeed. Nanny Connor grew Land Cress amongst her cabbages and reckoned that, despite the drought, her brassicas had never been better. 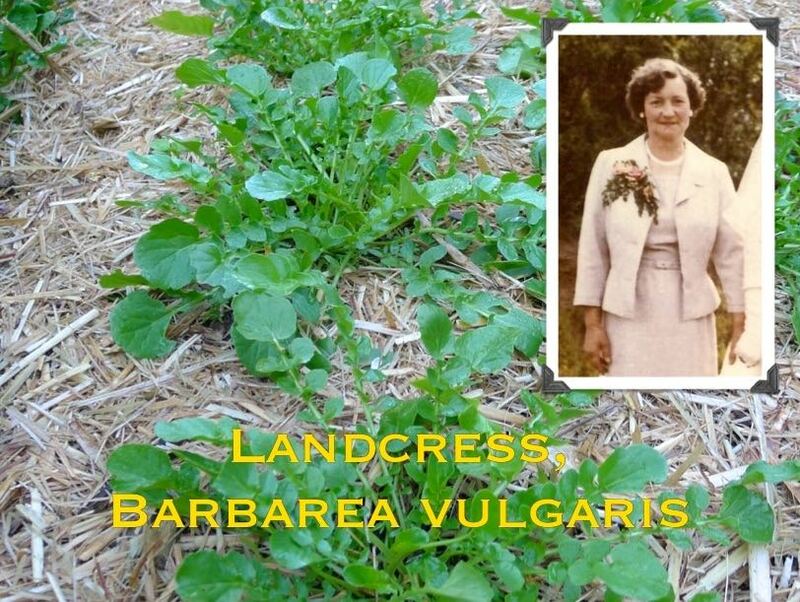 From then on she always grew Land Cress and firmly believed it to be a good companion and continued planting them together after her husband, Ron Connor, died. Through experience I have learned that many alleged companion planting combinations do not work and, when tested, are unsupported by scientific evidence. I have never grown Land Cress until 2013. Seeing it being advertised for sale made me feel nostalgic and I got some for old times’ sake. It was very surprising to hear Gurion’s research at the University of Queensland confirms Nanny’s companion planting idea is genuine and reliable. It is exciting to realise this has applications in 21st century agriculture, not just domestic gardens, for improving crops whilst saving money and reducing the need to spray. Nan and Grandad Connor, both dedicated, life long gardeners in the ‘Dig for Victory’ style, taught me ‘Never be afraid of experimenting. Observe what happens, and keep a record’. I greatly regret that their gardening note books were thrown out when they moved from London to live at Selsey on the coast. Very informative, will certainly try this. I have that growing and it is going to seed in it’s second year. I live in North Eastern Tasmania. Thanks for the heads up Jerry – I am just prepping a bed for kale, chard and the likes. They can have some friends now. Heart warming to see so many more gardeners producing not just seeds for themselves but also passing them on to others. Thank you! We did not know that we had landcress!! We would like to subscribe to your email newsletters, please. If you want post updates then simply follow the instructions on this website at the bottom of the page. Regards J. Many thanks Pam, and good luck with your Brassicas! I grow Landcress, Barbarea vulgaris. Never confuse common names – which are of little value – with scientific names. Jerry, I have searched many online catalogues but can not find one place which has Barbarea Vulgaris in stock. http://www.theseedcollection.com.au has it listed but not in stock. Love your segments of Gardening Australia, Queensland growers don’t get enough attention, it seems to concentrate on southern states. Green patch seeds also have it but you have to scroll down the page a bit. they also describe it (erroneously??) as Watercress Upland with the botanical name Barbarea Vulgaris beside it, so it takes a bit of a search. I bought a plant of it from Mudbrick Herb Cottage. http://www.herbcottage.com.au/upland-cress.html It works out rather expensive, but at least it is the real deal. Also bought seeds in bulk from Eden Seeds, but it turned out to be Barbarea verna, not B. vulgaris, which doesn’t seem to have the same desirable properties. 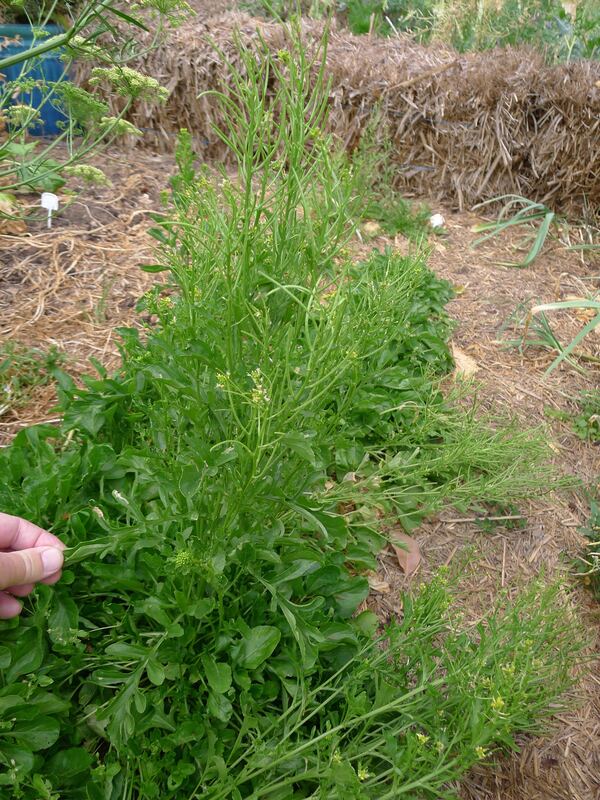 Looking at the photo of Landcress, it looks very much like the rocket I grow. Will rocket have the same as Landcress? Thanks so much for this. I grow land cress all through my garden just because it’s such an easy thing to grow. I find it thrives wherever I put it, from deep shade to full sun. I’ve also read that it’s the healthiest leafy green available, having no oxalic acid and a very high and diverse micronutrient profile. I’ve never been able to grow brassicas successfully and they all fall victim to white cabbage moth, but at least I have plenty of cress. I really enjoy all the garden program. Margaret.